Quran with Tafseer 1.0 is used to read and learn the Holy Quran in Arabic, Urdu and English Languages with five Translations and four Tafseer, all bundled together in one easy to use and small size of application. 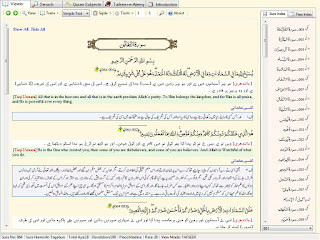 The software is equipped with a web type user interface for ease of use and provided Tafseer text with show-hide functionality also not required to install Urdu/Arabic language support, it can be determined translation and meaning of an aya from different respected scholars. These all resources can be freely used and distributed. • Urdu Tafseer: * Tafseer Ibn-e-Kaseer * Tafseere Usmani * Tafseere Salahudin * Tafseere Ateeq. • English Translation: * Justice Taqi Usmani * Abdullah Yousuf Ali. 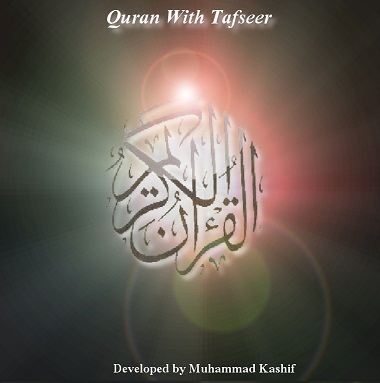 • English Tafseer: English translation of Tafseer Ibn-e-Kaseer. • Subjects of Quran Para wise from Tafseer-e-Usmani. • Para wise Tafseer-e-Ateeq . • Tafseer with show/hide text. • Search in Quran, Translations and Tafseer text with active marker 'highlight text' display. • Builtin Urdu and Arabic virtual keyboards. • Different View modes (Para, Sura, Fixed Aya, Tafseer). • Fonts changing of Arabic, Urdu and English text. • Internet Explorer style Favourites for Ayas. • View styles of reading text from Right to Left (Urdu) and Left to Right (English). • Changing of Different Color Themes at run time. • Print Preview/ Copy text to other applications. • Quick search: jump to any (sura:aya) quickly. • Sura and Para Details: Sura name, para name, Sura Revelation, Sura Place, Sura no, Para no. • No need to install Urdu/Arabic language support. • Sajda Ayas: Jump directly to Sajda Ayas. • Highlighting Sura as makki or madni. ASSALA MO ALIKUM DEAR BROTHER IN ISLAM. MY NAME IS MAULANA HIDAYAT UR RAHMAN .I AM LIVING IN MUSLIM ABAD BUKHSHI PUL PESHAWAR PAKISTAN AND I NEED SOME BOOKS FOR STUDY I NEED MANY BOOKS I WANT TO OMPROVE MY KNOWLEDGE AND SPREAD IT .I NEED MUSNADE AHMAD FATHUL BARE LE ALLAMA IBNE HAGAR ASQALANE ,ALBEDAY WAN NEHAYA ,AND SOME FATWA BOOKS OF SHAIKH UL ISLAM IBNE TEMYA ALL BOOKS IN ARABIC LANGUAGE I NEED .WHEN I STUDY IT THEN U WILL SEND ME MORE I AM KHATEEB IN MOSQUE AND HAVE OWN ISLAMIC SCHOOL HERE IN PAKISTAN MY ADREES IS MUSLIM ABAD BUKHSHI PUL CHARSADDA ROAD PESHAWAR PAKISTAN RECHED TO HIDAYAT UR RAHMAN PRINCIPAL OF (MMS) MUSLIM MODEL SCHOOL . I WILL BE THANK FULL TO U FOR THAT . Walaikum Asalaam, Jaanab Maulana Hidayat ur Rahman Saheb, Right now we do not have any such books. And most of these books are not free. Any one else here on this forum .. can help us in finding full and free available books? i want to buy all these books and want to learn quran online. Many people have the idea of reading the Qur’an. I am looking for quran with english translation so that I can read quran comfortably. Please give your suggestions to me. Nice post dude !! You doing a noble cause my spreading the knowledge of Holly Quran to such a variety of people in in different languages. There a mirror created for Quran for all you brothers and sisters. I was looking for the book "History of Tabari" which is a 40 volume set. I am doing my thesis on our beloved prophet (pbuh) but cannot afford to spend the thousands of dollars to buy the books. Can someone guide me to possibly download the same. Even if you have a few volumes, please do send me the same. Please mail me the info if possible on nnsk@yahoo.com. I have very less time to get submit my thesis on our beloved prophet and Allah will bless you mightily for your help. AOA. Good work. Quran is the final divine revelation and the central text of Islam. All Muslims should read and understand the Quran and follow the guidelines of the Quran. 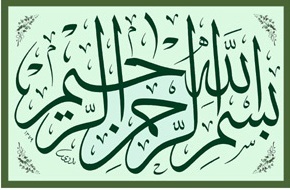 “English and Urdu translations of Quran”. 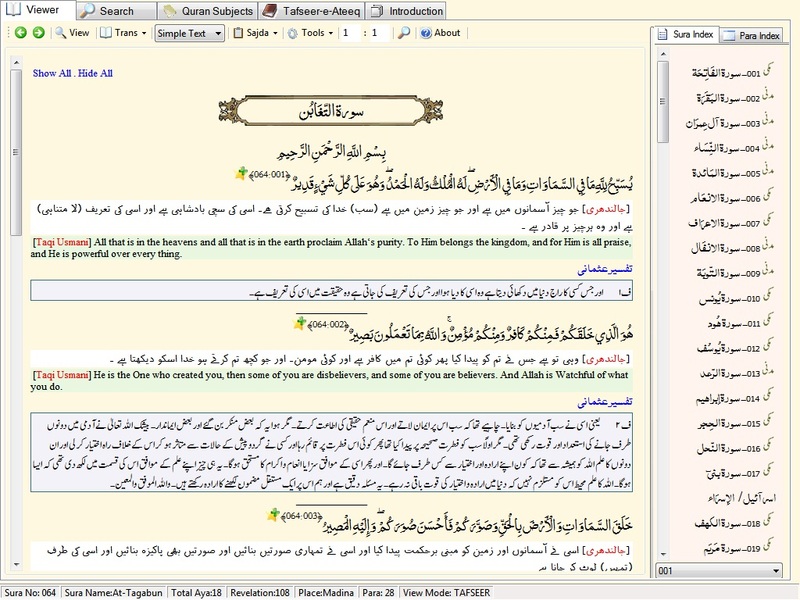 Quran with Tafseer Software is really wonderful and very helpful. thanks for great post. Thanks for Holly Quran translator. and other computer secure software is really useful for pc. Nice Islamic App and Blog! I want to share “Prayer Counter”. It is an iPhone application that assists Muslims in counting their prayers. This app is for Muslims across the globe who miss any of their prayers because of some busy schedule or any issue. Prayer Counter is a worthwhile app to help them remember the number of missed prayers. Salam.. Very nice blog mashAllah. Qibla Direction app works perfectly for your Android smartphone and wearable smartwatch. Yes. Its our duty to understand quran. jazakallah khair and may Allah protect everyone. keep practising Islam. I had been using Quran with Tafseer for couple of years. Now since I have windows 10 on my computer, I'm unable to open the program. It starts all right first time after installation but doesn't start once it's closed. I've to reinstall it to start again. I'm addicted to this handy program. Any help or suggestion please? Jazak Allah ho Khaira. This is such a nice and helpful post, brother! Having the translations of Holy Quran in so many different languages help to reach the Almighty's word to the greater audiences throughout the world. It is a very noble cause that you are performing. Keep it up! Shukriya. Khuda hafeez. The qibla compass direction finder is free application is free Qibla Direction Finder . The direction of Kaaba Qiblat is also update on this application. On the Android side finder Qibla. An Islamic compass for Qibla Direction Finder of Mecca direction for prayer times. Al Qibla to.